Abbreviation for myocardial infarction; mitral insufficiency. 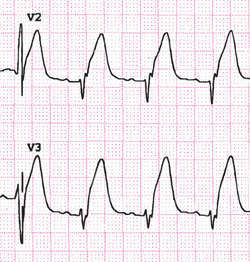 Abbreviation for myocardial infarction; myocardial ischemia. Q. What Are the Signs and Symptoms of a Heart Attack? I am 63 years old, suffering from chronic hypertension and diabetes for many years now. I know I'm at a very high risk for developing a heart attack, and I would like to know- what are the signs of having a heart attack? A. The complaint that most patients undergoing a heart attack (or- myocardial infarction) come with to the emergency room is severe sharp chest pain, that may or may not be related to physical activity. This pain can be described as pressure or burning sensation. It often radiates to other places such as the left arm, neck or jaw. Sometimes there are other gastrointestinal complaints such as nausea and vomiting. Sometimes there is even trouble breathing that requires ventilation. This combination of signs and symptoms is a "red flag" and it is advised to be examined by a doctor. And when pastor announced me as being on the MICAH Board of Directors, that was a really high step there. Micah has also donated items for auctions for the charity, and over the coming year will run competitions to get young fans involved with the project. Bad points: In a bid to stretch out what is a fairly thin story, a few red herrings are introduced such as Micah finding another girl who seems to be haunted in the same way. It seemed like the right thing to do," Micah said this week, unaware that people at the hospital and working in the Los Angeles Unified School District tipped me off about what he had done. Micah and his father, William Homans, of 25 Chippewa Ave. Both Seb and Micah, who is impressing for Manchester City, were pupils when they broke into the England Under-16 team. The gospel has to be [lived] not just with personal commitment, but also social commitment," according to Micah Challenge co-chair Alfonso Wieland of Peru. Joshua Micah Marshall asks what we will do if the Iraqis choose a government we can't live with. Based on a successful US phenomenon, Mr Heathcote's video, which is fronted by former British aerobics and world martial arts champion, Micah Hudson, will be available on the shelves of major high street retailers including W H Smiths and Woolworths shortly after Christmas. Micah Ansley, President and CEO of AAMP, will continue to lead the management team. MICAH Richards is a "winner" at the peak of his powers. Anne, a garrulous southern belle with Christian roots, and Micah, a quiet, studious Jew, find themselves attracted to each other when they both win scholarships to study in Cambridge, England.